Happy Friday! I hope you’ve all had an amazing week. It’s been quiet in our office today. I took it as an opportunity to reflect on the event I went to yesterday at the University of Manchester. The event included a workshop on communicating research to wider audiences. Today I want to share three insights from the event with you. But first, some background. 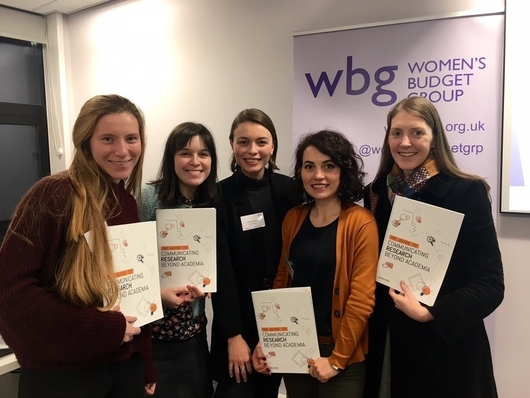 It was mid-December last year that I got an email from Sara Reis, Research and Policy Officer at the UK Women’s Budget Group (WBG). She was inviting me to speak at WBG’s early career network launch event on the 24th of January. I was delighted to receive the invitation and to hear that she came across our work on Twitter through our “Guide to Communicating Research Beyond Academia”. It’s always exciting when people “find your work online” and it gives a sense of purpose to all those late nights in the office and hard work. Sara told me that WBG’s network aims to connect feminist economists and public policy researchers that are at the early stages of their careers and organise sessions that they may find useful. 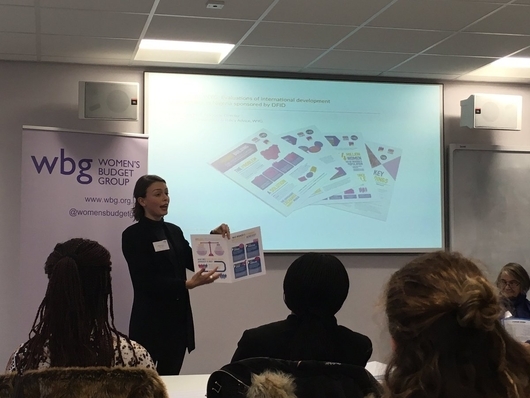 The event took place at the University of Manchester and started with a panel about feminist economics followed by research presentations from members. In the afternoon they planned a training workshop on communicating research to wider audiences. This session was about transforming academic findings into other formats that are accessible to the public and to policymakers (online resources, policy briefings, news articles, etc). Sara invited me to be part of this second panel and give a short 8-minute talk. The aim was to give the researchers practical tips they could implement immediately. Ruth and Anitha kicked off the panel and spoke about their research on Asian Women’s political activism. 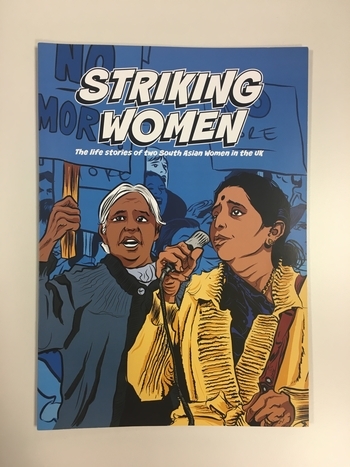 During their talk, Anitha showcased a gorgeous comic book that the team had put together to bring to life the two life stories on South Asian Women in the UK that fought for equality and better working conditions. I was mesmerised by the comic book (product of Matters Of The Earth) and read it with great joy today over coffee and doughnuts. I would have probably never learned about Jayaben Desai and her role as a prominent leader of the strikers in the Grunwick dispute in London in 1976 had it not been for this informative, visually appealing and creative comic book. This is encouraging news for researchers who dare to think outside the box and get creative about their dissemination materials. When talking about the importance of titles in communicating research, Ruth made an excellent point about taking time to carefully consider the title. “Striking women” has a double entendre – related to the ‘strike’ and the fact that they are ‘prominent women’. The short, punchy title catches people’s attention and is memorable and unique. You can learn more about the “Striking Women” project and take a look at the history and research behind Ruth and Anitha’s work. You can also read a bit more about the research journey here. Rebecca presented a talk about the relationship between researchers and journalists. She highlighted the importance of initiating and nurturing relationships with prominent journalists in one’s field. For example, if you do research education, you’d probably want to stay updated with the articles published by the Education Team at The Guardian and follow the journalists on Twitter. Rebecca also highlighted the importance of media training for researchers, how vital it is that they learn how to be comfortable in front of the camera and confident at communicating their message. She mentioned the “Media Spokesperson Training” offered by NEON which has proven effective for researchers. Navjyot made an excellent case for using Twitter as a researcher and gave lots of practical tips on how to use it effectively. For starters, she encouraged the audience to get on the platform and start an account. The main argument for using Twitter is the ‘short and sweet’ messaging, that allows people to get their message across in concise ways. Navjyot argued that Twitter can be used for a variety of things, such as, but not limited to, promoting published work, books, articles, events, insights from events, upcoming collaborations, reflections and upcoming projects. Moreover, she encouraged the used of hashtags and tagging of relevant people to maximise the reach of the tweets and getting as much engagement as possible. She also highlighted how important it is to follow relevant people for one’s field and staying consistent with the messages and branding. 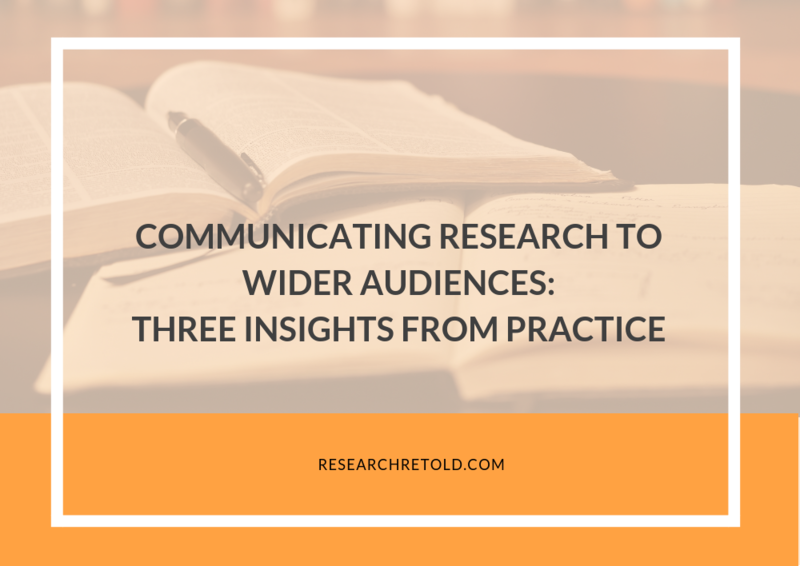 I also presented tips for communicating research to wider audiences in a short format. If you’d like a copy of the presentation, send me an email at mihaela@researchretold.com. Research Retold sponsored the event with five free copies of our guide. I love this photo we took of the night with Rosa Alonso, Cigdem Gedikli, Sarah Marie Hall and Annie Austin. Hanna Szymborska also won a guide but sadly she’s not in the photo! Thank you WBG for the invitation. It was an honour to speak at your event and connect with so many inspiring researchers.